Antigua and Barbuda’s ambassador to the United States, Sir Ronald Sanders, on Wednesday lamented the slow response by larger countries and international institutions to the recovery and rebuilding of the island of Barbuda which was devastated by Hurricane Irma on September 6. 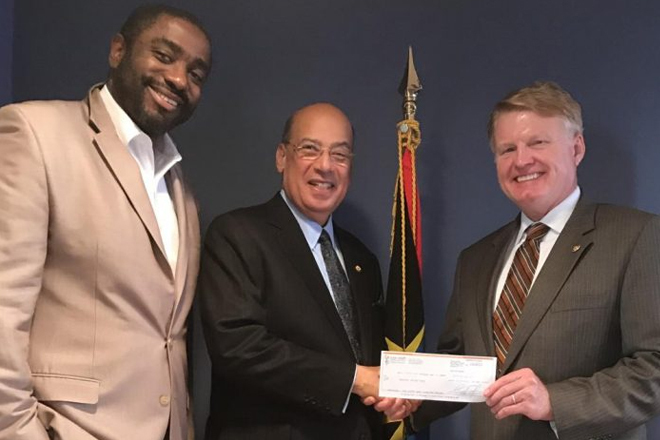 The ambassador was speaking on the occasion of a donation to the Barbuda relief process by the staff of the Organisation of American States (OAS). The Staff Association president, Steve Griner, visited the country’s embassy to present Sanders with a cheque for US$2,135.37.